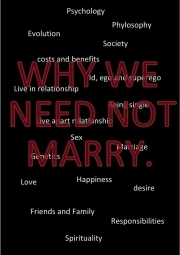 Description of "Why Need Not Marry (eBook)"
The book is based on the concept of Evolution, Psychology, Philosophy, Genetics & Spirituality. The first unit of the book starts with chapters on love, happiness, and id, ego & superego, spirituality and circumstances in which people should not marry, In the second unit marriages and other options Live in relationship, Live apart together are discussed. In the third unit cost and benefits of being single, being married and other options are discussed.In the fourth unit responsibilities of family, is discussed. Finally, the book ends with a final conclusion. I have done BSc and MSc in Microbiology and Ecology. MSc in Psychology is going on. Currently working for Government Organisation. Have a complex thinking nature. Reviews of "Why Need Not Marry (eBook)"